A friend bought me a copy for Kerbal Space Program for the holiday season. 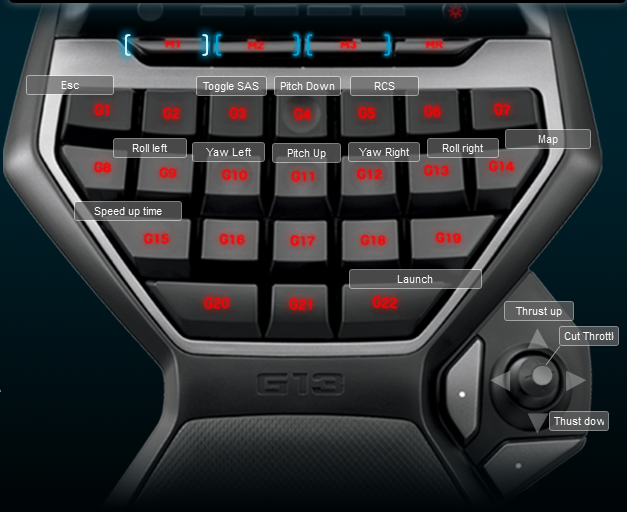 Naturally i created a Logitech G13 profile for it. It is a pretty basic profile since most of the game uses the mouse for interaction. The profile is only useful once you have started the launch process for a shuttle. I haven’t tried moon landing yet, which means I don’t know if the profile needs to be updated to support this. Below is an image of the keyboard layout.